‘Once a Unicorn, always a Unicorn’. Unicorns symbolize kind loving creatures feeding on magical grasses, dancing on rainbows all fluffy and free. Little girls love the idea of a faraway land with lucky white horses parading their unicorn and colourful manes about. 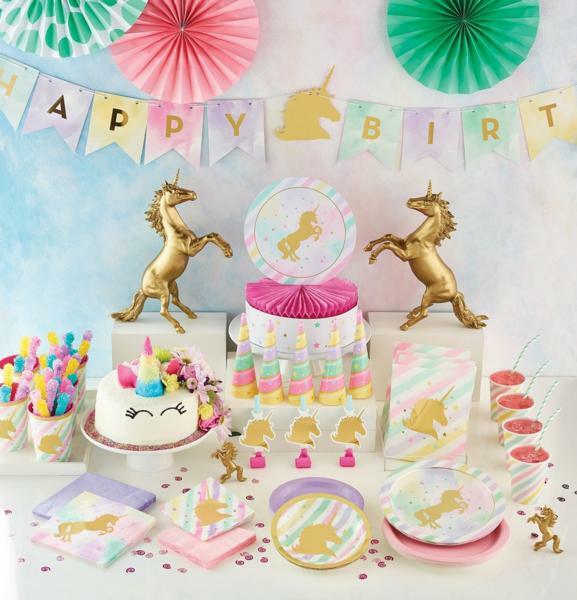 Why not treat your precious little Princess to a birthday party inspired by the magical mythology of the precious unicorn? Our Unicorn Sparkle Party range flows with gorgeous golds, sparkles, pretty pastels and stunning Gold Stamped party tableware, providing your daughter with that glam feel and our Magical Unicorn party range with rainbows and flowers is centred around our captivating white unicorn with her flowing pink mane offers just enough of that girly accent, for any party. At Just for Kids we have an abundance of wonderful themed party products available for creating that mystical ambience from cups, plates, napkins to glamourous supershape foil balloons and Glitter Tassel Banners to add the sparkle setting complimenting any party room. Detail your theme with our gorgeous assortment of charming coloured or marbled balloons forming an absolute showstopper followed by decadent Unicorn cased cupcake for your guests to enjoy!